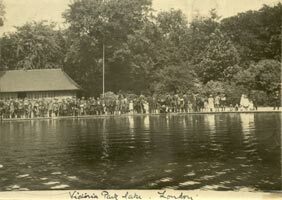 Victoria Park in Hackney, East London E9 is the spiritual home of tethered hydroplanes, The Victoria Club is over 100 years old and has its water and boathouse in a delightful tree surrounded location on the eastern side of this large London Park. When visiting this spot it is hard not to be touched by the ghosts of the past, recalling such names as Ted Vanner, Stan Clifford, Arthur Cockman, the Innocents and Ernie Clark from the home club, and visitors such as Gems Suzor, Westbury, Noble, Lines, Williams and a host of others. A place that brings a tingle to the spine that is exciting and humbling at the same time. Reflecting on the famous boats that had run there (how much nicer when they had names) and the splendid regattas of the past, including the first ever MPBA Grand in 1925, produced a delightful state of reverie only shattered by the scream of a modern hydro being wound up for a run. Formed as the Victoria Model Steamboat Club in 1904, by a number of boat modellers that frequently met at Victoria Park lake, the club has embraced hydroplanes almost throughout their entire existence, from the ‘heady days’ of 8mph top speed to the staggering record currently held by club member Norman Lara at 135mph. Originally the boats would run free, and regularly double up as straight running boats, but as speed increased the use of a pylon became universal. The first annual meeting was held on 6th August 1905 with W J Spinks in the chair. One of the Club's patrons was MP Horatio Bottomley who donated £1 to the club funds. By 1907 the Club would meet pond side on Saturday afternoons 'before an enormous public of small boys' as well as Sunday mornings 'before a wall of charming young ladies'. Indoor meetings would take place in a classroom loaned by Rev Neville Dundas of Holy Trinity in Stepney. Members paid a subscription of one shilling a quarter at this stage. 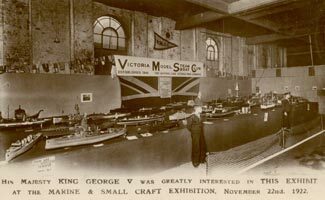 1907 also saw the VMSC as one of two societies exhibiting at the first Model Engineer Exhibition held at the Royal Horticultural Halls in London. The first president and one of the founder members of the VMSC was 'Uncle' Jim Crebbin, perhaps better known to the modelling world as a keen locomotive modeller, who donated the Crebbin Trophy for steam driven hydroplanes to the club. 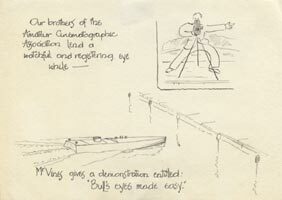 Another founder member who had a profound influence on hydroplane development was Mr William Blaney, who wrote many articles for the 'Model Engineer' under the pen-name 'Carpenter's Mate'. 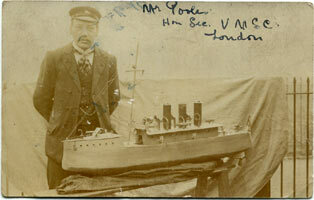 Ted Vanner recalled that he, along with other VMSC members, took part in the first ever Model Engineer Regatta at Wembley Park in 1908. 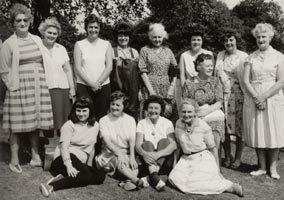 They all met at the boat house in Victoria Park at 5.30 in the morning where Mr Blaney was busy cooking eggs and bacon over an oil stove for breakfast. They set out for Wembley in a horse drawn van carrying boats and owners, 'stopping at a few hurdles on the way'. The first secretary was a C T Webster, and it was he who successfully petitioned the County Council for the use of a gardening hut as a boathouse. The current brick building was opened on the 1st April 1909 and the first tenants were the Eastern Yachting Assoc. The first of the club's longer serving secretaries was Mr Poole who lived just across the road from the Park and is easily recognisable in photographs by his yachting cap and moustache. He served into the 1920's until W H Phillips took on the job, but continued to officiate at events for many more years. 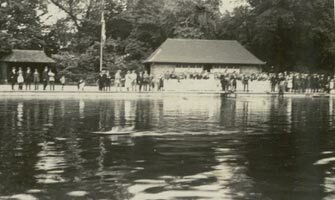 Possibly the earliest photo of the lake and Club house. No enclosure. Flash steamer running at 24½mph on Sept 29th 1915 Postcard from Charles Lutz showing Club stand Nov 1922. Marine and Small Craft exhibition. 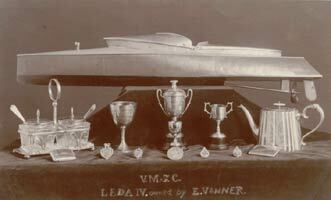 During the AGM in Feb 1921 VMSC took the decision to resign from the MYRA, and to hand back all the trophies. 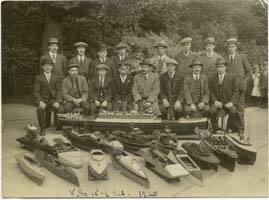 The Model Yacht Racing Assoc had been the governing body for all boat racing up till then. 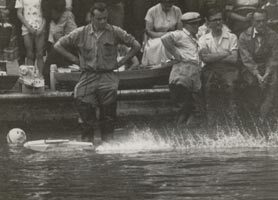 The following year a meeting took place between the Highgate and Victoria Clubs at Victoria Park where Mr King the secretary of Highgate suggested that all powerboat men get together to form a national racing association. 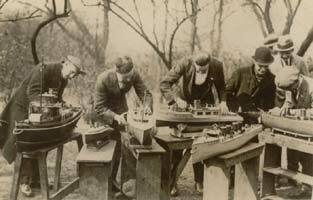 This led eventually to a meeting on 12th April 1924 at the home in Hampstead of Victoria member Mr Jackson where the Model Power Boat Association (MPBA) was formed. 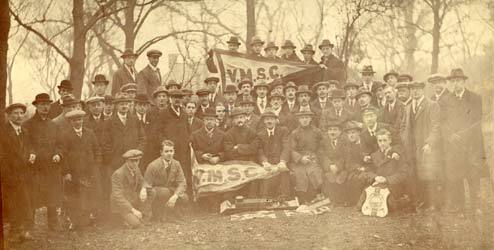 The VMSC was one of the six founder members of the MPBA, providing both the chairman F J Pierson and secretary/treasurer John G Philpot. It was a man's world in 1924 and although Olive Goodman, later to become Mrs Jack Skingley, was one of the founding members of the MPBA she was sent to the kitchen to make the tea while the 'chaps' discussed boating matters. 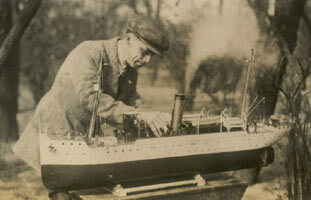 VMSC members 1920 Mr Morss with his steamer 'Belle Morse' The 'Old House' in 1923. Enclosure and flagpole. Although the lake at Victoria Park had seen many well known competitors and fine performances from a variety of craft, the venue gained its real prominence when it started to host major national and international regattas in conjunction with the MPBA. The most famous of these was the International that was arranged to coincide with the Model Engineer Exhibition so that visitors from overseas and from other parts of the country could combine both events. The first of these was in 1925 and an overseas visitor, who was to gain legendary status in this country was Mons. G. M. Suzor from Paris who bought over his boat Canard. Canard took everyone by surprise as its two-stroke engine of 17cc easily won the 100 yards straight course at 16 mph from a standing start. Quite a remarkable performance. He repeated this feat again at the 1926 event, still with Canard. In 1931 he won the event for the third time with Nickie and thus retained the trophy. His time was a record for that period at just over 35 secs. Mons Suzor entertained the spectators to an exhibition run later that day, doing ten laps in 70 secs. 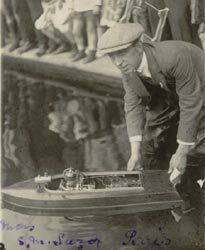 The other premier event was the Grand Regatta and amongst the winners in 1925 was Stan Clifford winning event number 5 on the circular course with 8 laps in 70 secs. Stan was to be a very successful member of the VMSC for many years and started his competitive career by winning the ME 1924 Speedboat B Class Championships with Chatterbox II with a new record of 36.3mph. 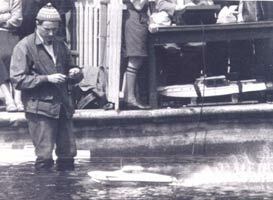 Stan won again in 1926 with his flash steam boat Chatterbox III and establishing a new record at 43.84mph. Stan Clifford had given an exhibition run of Chatterbox III on the circular course at Victoria Park during the event, which was filmed by Mr W Bassett-Lowke who used the new Cine-Kodak The resulting film was screened at the Model Engineer Exhibition during that week, where Chatterbox III was given pride of place on the VMSC stand. One of the visitors to the Clubs stand at the ME Exhibit. was Fred Westmoreland from Manchester, of Evil Spirit fame, who joined the VMSC that year. His future son-in-law George Lutz and friend H H Groves were also VMSC members. 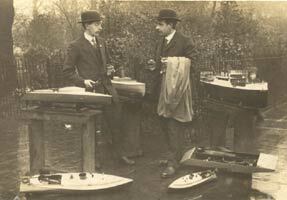 Fred Westmoreland and H H Groves can be seen with Mystery and the miniature hydroplane. To the left of flag is George Lutz and above the Victory Shield is Mr Poole. Although best known for steering and straight running, Ted Vanner who was a VMSC member for over 60 years also used to compete in the speed events both on the straight and circular courses. 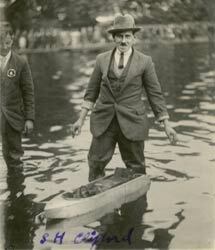 He would also compete at regattas all around the country carrying his boats on the train. It was another epic journey to represented VMSC in Paris in 1927, winning first with Bon-Ami, second Leda III and third with Ledaette. His wife Daisy was another long standing member of the club and would be present at regattas, right up until her death in 1973, often officiating at the presentation of awards. In 1965 she was part of the Victoria contingent that travelled to the Brussels Regatta. This was most appropriate as it was Daisy and her late husband who had organised the first International Meeting of enthusiasts in 1927. 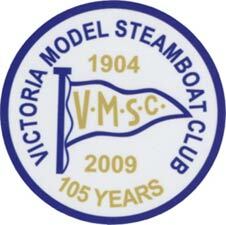 Other well known names in the VMSC with straight running boats included Mr Vines and his 'Silver Jubilee'. The stories of Ted and other members on their travels seem most remarkable from this distance, but the Victoria Club was never a parochial organisation as they used to visit other venues en masse. A lorry would transport the boats and equipment while a charabanc would be hired to take the members and their families on some true adventures. Travel being what it was then, there were occasions when the 'camion' would not arrive until the events were well under way, but this did not deter anyone. Club outings by coach would continue well into the post war era, although the lorry was dispensed with. The ME Speed Boat Competition in 1929 was run under new rules, the implementation of which seemed to caused some uncertainty, and a low entry. Four classes A-D with A Class from 14lbs to 16lbs and D Class 10lbs and under, simple but it was not without its critics and voices of dissention. However a silver medal was won by VMSC members, brothers A & J Skingley for the performance of their boat Cissie IV, with a certified speed of 21.75mph. The engine being a single-cylinder two-stroke petrol engine, the weight of the boat, 11¾ lbs put it into Class B.
Jack Skingley was a stalwart of the club and served as secretary for nearly 23 years. In Sept 1932 he wrote to the 'Model Engineer and Practical Electrician' as the magazine was then known, appealing for information as the Clubhouse had been broken into and petrol engines, blow-lamps and tools had been stolen. The thieves had also damaged several boats in the process and Jack asked anyone that had been offered such items to get in touch with him. Edgar Westbury, in an article for ME entitled 'Concerning Twin Two-strokes', commented that 'one of the best example of a small twin two-stroke engine was built by the Skingley brothers'. 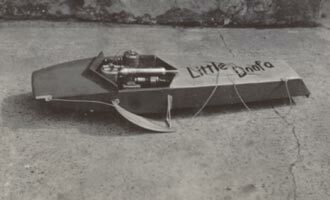 Used in their metre hydroplane 'Vixen' it had 25cc capacity with an inch bore and stroke. Westbury went on to say that the engine was an excellent example of both design and workmanship, and ran remarkably well, although he added that it did not have the same power as a well designed single-cylinder engine. The longest serving member of the VMSC, and member of the MPBA for over 70 years was Jack's wife Olive. As Olive Goodman she had been a member for many years before they married in 1932 and they worked together until 1953 when Jack died. It was a sad year for the club as the chairman Tom Hayday died that year as well. Olive served as assistant secretary for some while, eventually being made a Life Member and later, a Vice President of the club. Following Jack's death, Ted Woodley became secretary. Ted had moved down from the Enfield Club, along with Bill Everitt, who took over as Chairman and remained in the post for eleven years, until his untimely death in 1964. 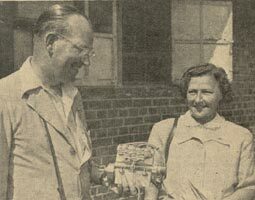 Right: Jack and Olive Skingley c1946 with the four cylinder Seal engine for 'Josephine'. Ted was secretary for 3 years before his work with the Lotus racing team took precedence. Norman Phelps then took on the job and remained in that post for many years and is now President. Norman's wife Iris was a keen competitor also, as well as being a fine model engineer in her own right. She also held the unique honour of being the first lady to win the Grand regatta in over 50 years when she took first place in 1960. Olive Skingley later married Arthur Cockman another highly successful competitor with his 'IFIT' series of flash steam hydroplanes. She competed in her own right for many years winning the steering event at the Brussels Regatta in 1965 with her four cylinder, Seal engined Josephine. ME reported that "Mrs Cockman grew so fond of the Belgian water that she had to be fished out of it". At the 90th anniversary of the Club, Olive cut the celebration cake with fellow Vice President Terry Everitt and Norman Phelps. 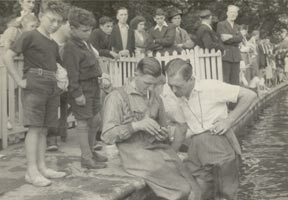 At the Grand Regatta in 1933 one of the very earliest members of the Club, Mr W J Smith, paid a visit whilst over from Australia. Mrs Smith who accompanied him on the trip presented the prizes. Mr Smith, better known as 'Belvedere' Smith was a pioneer of petrol engines in hydroplanes and produced a range of motors from his works in Hornsey before emigrating in 1913. He had appeared in the very first organised regatta in 1908 as a Victoria member with his petrol driven boat 'Belvedere', which won 3rd prize. Smith also made a return visit in 1948. Another long standing club member, Charles Lutz, had taken over the manufacture of the 'Smith' engines under the name 'Victoria'. 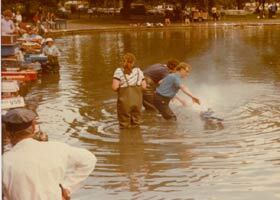 The lake continued to be a battleground for supremacy between flash steam and IC engines. Stan Clifford had raised his record to 43.3mph by 1926 which remained in place until 1936 when the Innocent brothers running the 30cc four-stroke 'Betty' took the record with a speed of 47.47mph. 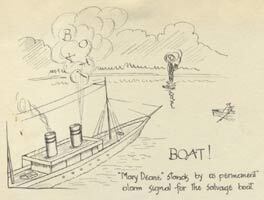 Stan would be the last person to hold the out right record with a steam powered boat. The Clifford name was still appearing in 1964, although under the St Albans banner, by winning the Diamond Jubilee Regatta A Class with Polyester at 63.92mph. The ‘boating lake’ is now significantly smaller than it once was. Previously the open air 'bathing lake’ was quite deep in the centre with various diving platforms situated around it, likened to miniature Southend piers by free running competitors who claimed they acted like magnets for their craft. The concrete bottom used to be fairly slippery and many a competitor lost their footing to the wry amusement of onlookers and those that reported the resultant soakings in the pages of Model Engineer. London County Council divided the area into three smaller lakes in 1937. The 100yd long by about 60yd wide boating lake was of an even depth suitable for wading and was constructed from concrete. For tethered hydro running there were several eye bolts sunk into the bottom for tethering the tripod. The main criticism about the lake was that the vertical banks created some backwash. 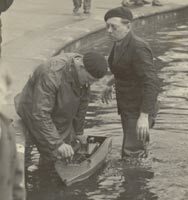 The VMSC, now with one of the founding members William Morss as its president, provided the boats for the TV outside broadcast of model power boating at Alexandra Palace. Eight straight running boats made the first programme followed by a second broadcast on July 13th 1937 where six hydroplanes each covered a 500 yard course in a total of 8 minutes. 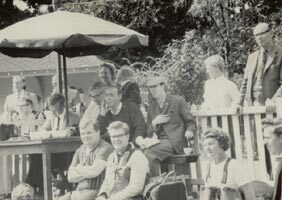 Such was the popularity of the venue that the Grand Regatta in 1938 saw representatives from twenty clubs competing in the various disciplines. One competitor was present all the way from the 'Irish Free State'. With the out break of war many local authorities placed an outright ban or serious restrictions on the use of many ponds or lakes. VMSC were lucky in that they retained some of their running facilities but it was not until 1942 that they held a mid-summer regatta. 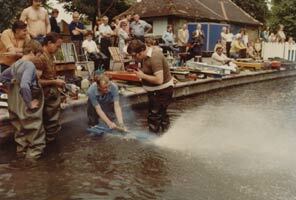 Money was a major problem but club members dug deep into their pockets and a free open event was duly organised. 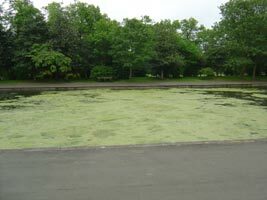 For three years the pond had been neglected and weed and algae proved to be a problem. Boats too, had not seen light of day for three years and some had suffered along with their owners having to be dug out of blitzed houses. The covering of weed has been a recurring problem since the lake was divided. The report of the event commented that 'a break for refreshment , which, in spite of war rationing, did not produce any evidence of famine in the land'. In 1945, the boathouse and lake, along with a number of well known members and their boats featured in a film that was being made, called 'Model Husbands'. It was suggested that a 'sub standard' version of the film would be made available for hire to model engineering societies. Has anyone ever seen this film? 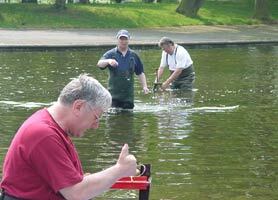 A new event on the circular course was for boats having engines of less than 10cc and was called the 'Austerity Class'. Based on the ME, Edgar Westbury 24" hydroplane design, most had been built during the war period. 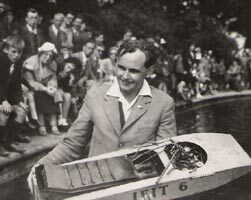 Arthur Weaver, then a VMSC member entered an ultra-miniature boat powered by a 'Kestrel 5' but Mr Sharvell had an even smaller craft with a commercially produced engine, a 2.3cc Ohlsson. Mr Heath of the VMSC won the event with the 'veteran' Derive II. The meeting was hailed a complete success, and despite increasing difficulties continued to run throughout the war years. The 10 years from the end of the war into the 1950s were probably the most successful for the club in every respect. Those who had competed previously, came back with new boats that embodied all the latest thinking in hull design, propeller technology and bridling systems. This period also witnessed some remarkable design, engineering and experimentation in terms of the motors that were being used, with the two-stroke becoming predominant. The arrival of commercial 5 and 10cc motors also led to a rapid expansion of the number of people and boats competing at club meetings and regattas. The level of competition at the club led to rapid development in every class with resulting success for Victoria members at regattas all round the country. In the 30cc A class Ernie Clark, Bill Everitt and Stan Clifford regularly swapped top spots in the results lists, with Ernie taking British and European Records with his Gordon boats. Bill Everitt won a number of prestigious events with his 30cc boats, and along with Dickie Phillips and Ken Hyder would dominate the smaller C class for many years to come. Ken and Dickie, along with Stan Clifford would later become St Albans members when work required them to relocate. There was a change underway, as the superbly engineered four stroke engines were no longer able to compete in terms of out right speed, leaving the 10cc two strokes to rule the roost through to the present day. This did not stop the manufacture of some pretty exotic motors in all classes, with the A and B classes still being hotly contested. The flash steam enthusiasts, through constant experiment and development, continued to produce remarkable performances, and while never quite matching the IC motors in top speed, would often feature in the results lists at regattas. 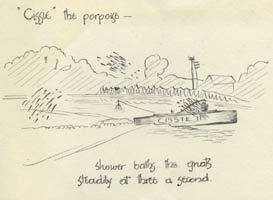 The lipped concrete sides to the pond and the proximity of the boats to the edge meant that rough water has always posed a challenge to competitors on fast runs and many correspondents in Model Engineer have made mention of this problem, but none more so than George Stone of the Malden Club. Having won the Swiss International regatta and set a new absolute speed record, he claimed that that high speeds were impossible at Victoria. His comments caused a furious reaction from many quarters that went on for many months in the pages of ME and yet he was shown to be quite wrong, with boats of all classes quite capable of running at record breaking speeds on that water. During 1949 there was discussion over the feasibility of using tarpaulins draped over the pond side to break up the wash, but this seemingly was not pursued. Another contentious issue was that of noise, with the London County Council requiring that all boats be silenced to meet their 'effective silencer' clause. 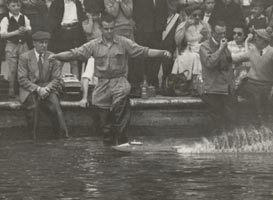 In a letter to Model Engineer in September 1954, the Secretary, Ted Woodley pointed out that due to 'the total disregard shown for the noise clause', a sub committee had been set up to stop any boat from competing, round the pole or straight runner, that contravenes the regulations. The Victoria Jubilee Regatta held to celebrate the clubs 50th anniversary attracted no less than 70 entrants. Clubs represented included Bournville, Wicksteed, Southampton, Aldershot, Welling, Southend and St Albans. 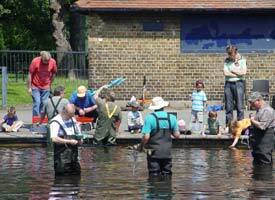 Local clubs Blackheath and West London also featured. Unfortunately the weather was reported as being appalling with continuous rain all day long just varying in intensity. They had better luck for the 1954 MPBA Grand Regatta later that month, the writer used the words "a remarkable occasion". Firstly the weather conditions were fairly good but with a breeze blowing down the lake. 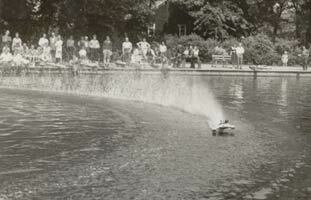 Secondly, the large attendance which saw a hundred straight running boats and 50 hydroplanes. VMSC has always been very much a family affair. The children grew up together, while the adults ran the boats, and later, it was not uncommon to see two or three generations competing at the same time. Norman Lara recalls the whole family, father 'Nobby', mother, sister and himself along with boats and gear catching a bus from their home to the Park to compete, virtually every Sunday. Indeed, Jack Skingley was quoted in Model Engineer 'that the Club membership stood at more than 70'. 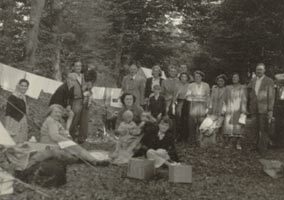 Entire families made an annual trip to Southampton for the regatta, camping along the way as seen below centre. 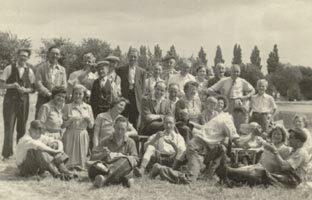 Mr Phillips, Jose Skingley, Ron Skingley (in front of her) John Benson, Joan Benson, Stan Poyser, Lita Lines, Beryl Poyser, Olive Skingley (later Cockman) George Lines. From Left to right: Mrs Dinelli Mrs Phillips (sitting) John Skingley Bob Dinelli (possibly Steven Poyser?). At front possibly Bob Dinelli's daughter with child. Lady right at front unknown. Ladies from the Victoria Club. John and Joan Benson think they went twice to Southampton on trips like this, in convoy, sounds great fun. Apparently John Benson and George Lines were members of Victoria at this time so they could go to the pond for practice but did not ever run with Victoria numbers. 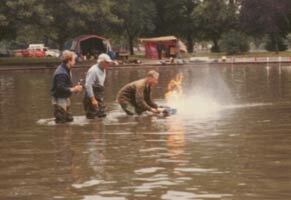 John was MPBA secretary and writing up the regatta reports for the ME as "Meridian" . A short bit on the regatta was in Vol 107 no. 2678, Sep18 1952. 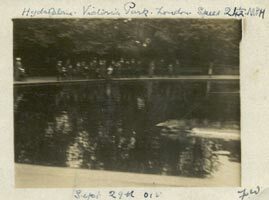 As other established lakes and ponds in London were lost to tethered hydroplanes, Victoria Park would host many regattas run by clubs from those locations, including Forest Gate MPBC, North London SME, West London MPBC and South London MEPBC. 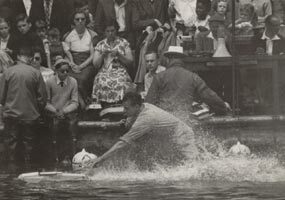 When the Prince of Wales Pond on Blackheath was lost to hydroplanes in the 1970s, Victoria became the last venue in London that could run tethered boats and is now one of just six hydroplane venues left in the country. By the mid 1970s it became apparent that the speeds being attained were no longer safe for this public lake, leading to the committee imposing restrictions on the classes that could be run and instituting an upper speed limit. This brought to an end seventy years of full scale hydroplane regattas at this venue and an inevitable decline in the numbers of boats appearing at events. In spite of this, many of the countries leading competitors were based at Victoria with Terry Everitt, Norman Lara, Stan Poyser and Ian Berne breaking records on numerous occasions. Norman has also appeared on the victory podium at World and European Championships on a regular basis. 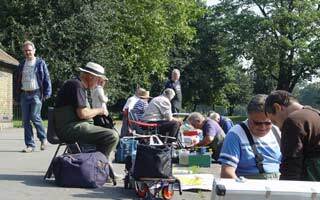 Currently 7 British records are held by Victoria members, yet they are only able to run the smaller classes and vintage boats on their home water. The VMSC is still an active club though, and holds around 15 regattas a year, about five of them being open to MPBA clubs and the rest for members only. One event in 2008 saw twenty two hydroplanes competing which is something of a record in recent times. The 105th season at Victoria Park has not been one of the most successful as the weather conditions have conspired to cover the lake in a thick blanket of weed (not a new problem, as ME reports from the past indicate). The lack of rain and cracks in the pipes has led to an unacceptably low water level and cancellation of the remaining regattas. The future for the Club and lake looks most encouraging though, as Victoria Park has won a bid for a Lottery grant of 12 million pounds, much of which is to be spent on the East side which includes the boating lake. Just as a group of boating enthusiasts at the turn of the last century could be found pursuing their hobby at the lakeside, future generations should be able to continue running boats in Victoria Park under the auspices of the Victoria Model Steamboat Club. assisted by Pete Dirs anchor the pylon 2008 was one of the most successful seasons both for weather and numbers of boats running. Siggy Grashof from Germany attended this regatta. All the early photos are from the Westmoreland archive, by courtesy of Ken Lawton. For the later pictures we thank Tony Pilliner, Rob Bamford, Stan Poyser and Jim Free.